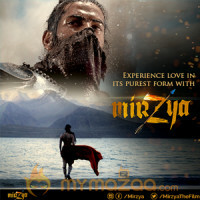 Mirzya (Mirziya) is a romantic thriller movie directed by Rakesh Omprakash Verma. This latest flick has Harshvardhan Kapoor and Saiyami Kher in lead roles and both of them were a debutant in the industry. The movie released on October 7 received positive reviews from released centers. Lets see about it. Harshvardhan Kapoor and Saiyami Kher were childhood friends. They lived in the same village and are from different family backgrounds. Harshvardhan is from a poor family and Saiyami is the daughter of a rich man in their village. But fine day Harshvardhan vanishes and return after a long time. Harshvardhan is in love with Saiyami and her father is not accepting their love. The story twirls around to show up some history. The movie then focuses on the love and relationship of Harshvardhan and Saiyami in their previous birth. How the story of Harshvardhan and Saiyami ine the present and the past interlinks inside the movie is the plot and watch it in theaters. When watching the movie our eyes will set on two characters played by Harshvardhan Kapoor and Saiyami Kher. The movie Mirzya had good talented actors to hold its story strength with their performances. Harshvardhan as a warrior and a lover boy played very well in the movie. Saiyami looked so good in her getup and played her part too good to be apt for the movie. Director Rakesh Omprakash Verma who tried to give a romantic film strictly tried to show how humanity is treated in present and past. As a director, he had succeeded in making good movie with debutant stars. The cinematography of the movie needs special mention. Each and every shot taken for the movie scenes is very impressive and the editing made the movie complete. Overall the movie Mirziya is one of the best movies from Rakesh Omprakash Verma and he had gifted two talented stars for the Bollywood industry. A warm welcome to Harshvardhan Kapoor and Saiyami Kher to the film industry. Watch the movie in theaters.